Mizard Black is a wired woman with hooked nose, small head, black hair. She was raised in a small village in Dorado. Both of her parents knows magic, but there is no indication shows that she knows a little magic. She was sent to a muggle school, but her life goal is to enter Ilvermorny School of Witchcraft and Wizardry. At her 11, in a chemistry class, when the professor was rolling the test tube to mix the reagents, she fainted and fell on the ground. When other students support her to sit up, she moved one’s lips with eyes closed, “The last persons leave this room will leave tonight”. But no one put her words in mind. The alarm ringed. FIRE!! 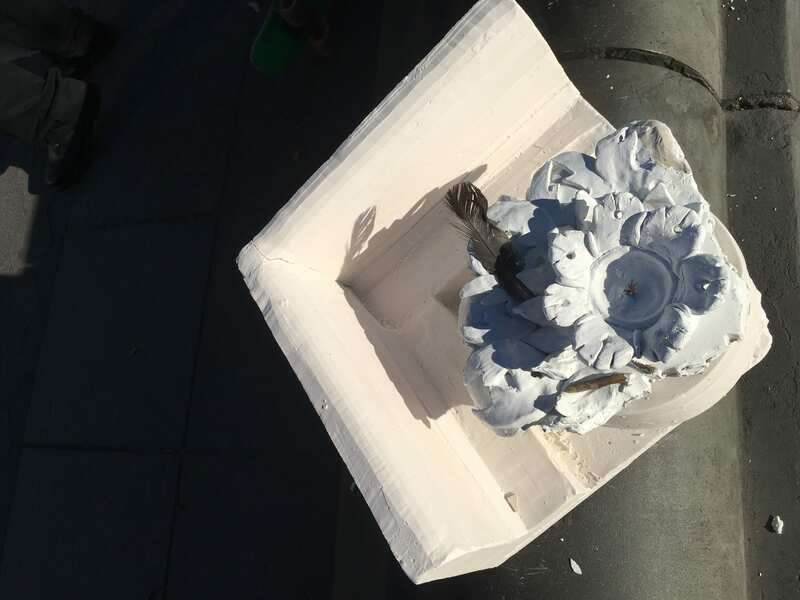 Smoke gushed into the classroom from cracks in windows, and the temperature in the room was higher and higher. Everyone was fracked out. The professor tried to keep calm, and line all the students to leave the room one by one. 40 students. When the last student stepped out of the door, the professor fainted because of the heavy smoke. He was rescued, but that night, he caught fever and kept fainting. The second morning, all the students heard of the news that the professor dead of infection in lung. From then on, Mizard spent ’s parents began to prepare her to go to Ilvermorny School of Witchcraft and Wizardry. She improved herself rapidly in that school. It’s warm sunny day, Mizard was walking through Washington square park to enjoy the weather when suddenly the sky turns pitch black, you can’t see a thing, everyone around her starts screaming and running. In fear she did the same and tried running towards building to her, but right as she got close enough to it, the entire collapsed. she looked around in shock only to see every building around her collapsing. The only thing left standing was the arch in the center of the park. Suddenly she heard something like bird flapping its wings, then she noticed that something brushed past, but it was too dark to tell. She freaked out and woke from the dream. The scary scene in that dream always appeared in her mind, no matter when she was reading, cooking, or shopping. She knew her ability of predicting, so she was very worried that the dream was a part of the prediction. She could never let that happen and see people die, so she decided to do something. She had to figure out who was going to do such a thing, then she found out about the evil doer named Blader. Meanwhile, she remembered her father had a book on gems that gives power only to find all those gems have been destroyed, except the one that Blader has and the emerald. She spent 5 years traveling around the world and eventually found the emerald in an Irish volcano. She tried to implant it in herself, but her wizard powers would not allow her to do that because they weren’t compatible. Then she thought of the idea to hide the emerald in the only place she knew. She brought it back and hid it in the arch at Washington square park because in her dream, the arch was the only thing that left. She also made a prediction that only the person with a pure heart can find and control it. Time elapsed, the hero who can found the stone still didn’t appear. 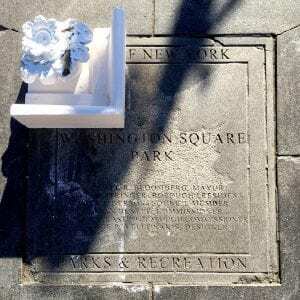 Mizard got more and more anxious, so she went to Washington Square Park everyday to tell people the end was coming. Obviously no one listened to her and thought she was crazy. Jin is an 11 years old kid from the orphanage in the Greenwich Village. He was a small and weak kid. 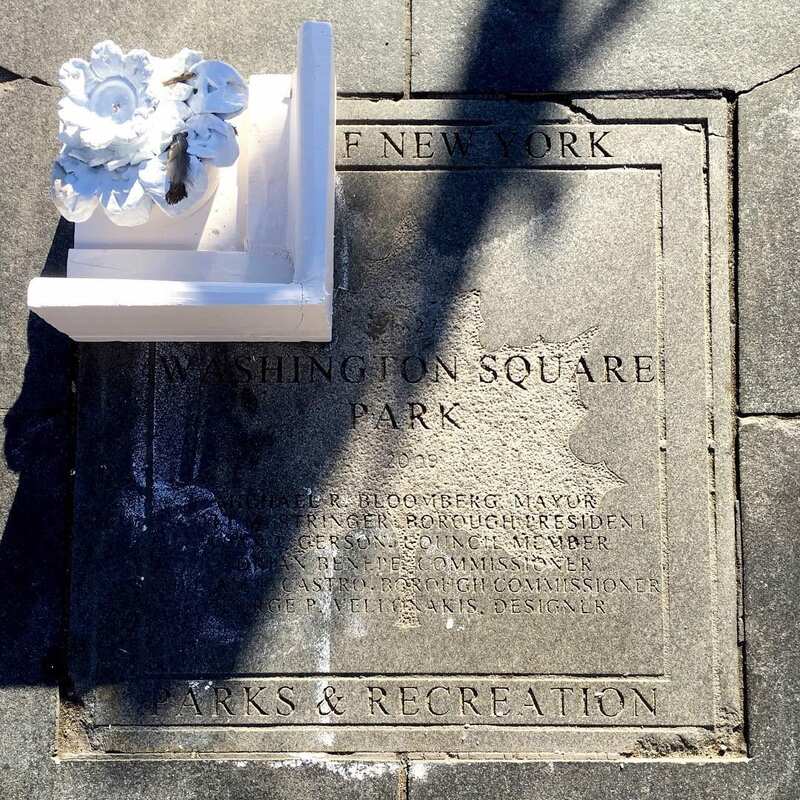 He went to Washington Square Park every day because he hardly had any friend. In Washington Square, everything was there; musicians, painters, children, dogs, birds, and beautiful sunshine. It was a dreamlike playground for him. He liked sitting on a bench and watching people passing by because he believed that it calms his mind. One day, while he was taking a stroll, he sees a beautiful shiny stone colored emerald green under the arch and at the same time, his eyes started to burst with curiosity. He looked at the stone for a while and found himself magically moving toward the stone. He did not know what it was, but he could sense a strong power coming out from the stone. So he picked it up and put it in his pocket. He liked it so much he carried it with him all the time since then. At midnight, he goes to the park again with the stone in his pockets because he had nothing to do in the orphanage. There were not many people at night. He was pretty much alone, and it was dead quiet, which scared him a little. When he walked far enough over the arch, he sees some dark shadow moving in front of him. He got scared and tried to go back to the orphanage, but as soon as he turns back, a mysterious shadow took the stone away from him. It was really quick. He did not realize that the stone was missing until Joseph appeared. Joseph is waiting outside the washington park for meeting Jin. He wears a army green hoodie and jeans, who looks like a 20 year-old young man. Joseph knows his mission is to help Jin to develop his power and save the world. He believes to be similar age as Jin can let them get know each other much more quickly. Jin now is too young to know everything, so Joseph would like to talk to him slowly and teach him steps by step. “Jin.” Jin answers without any facial expression. Jin stops talking and his eyes looks at the corner. His right hand is in the pocket, feeling something inside. “What’s inside your pocket?” Joseph knows that the opportunity is coming. “Really? !” Jin’s face shows his surprise. He shows his stone to Joseph with curiosity. “It is okay, because you are the person who can take it back and use it in the future.” Joseph continues. “What do you mean? I can be a superhero in the future?” Jin starts to be excited. “You are my mentor? !” Jin almost shouts out loud. When they continue their conversation, they do not notice the danger is coming soon. My name is Blader, who is skilled in numerous martial arts, and I have the ability to control and morph my shadow freely. I have been full of hatred for people since I was a child. My parents have abandoned me on the street since I was born. One day, nice nun saw me and took me to the nursery. But inside the nursery was like a jungle, so I tried to survive in the hierarchy inside of that place. However, I was left out alone because I could not get along with the children who were in the nursery before, and the result was to get bullied and scolded. The nursery was a safe place to eat and sleep , but I did not want to be hated or harassed by someone elses again because It reminds me the memory of my mom and dad who abandoned me. At 3 a.m. in the dark, I quietly ran and ran out of the nursery. It was a cold snowy winter and there was no one by the roadside. Tear bursted up on my two eyes. Suddenly, huge man tapped me on the shoulder while I was crying. “I can totally understand your sorrow, kid.” the giant guy comforted me with low and gentle voice. He told me he has a same grief as mine and he was willing to take me with him. I sensed somewhat compatibility towards him and decided to live with him. I was trained every day so that I can fight with anyone who look down on me, and by the time I mastered all the martial arts, he gave me a tiny black stone and implanted on my body. He gave me the ability to handle all properties with the shadow. By the time I was twenty years old, I learned various skills that I can use with the stone from him and he died when I was just turned into twenty years old. “Emerald… Find the emerald stone and make it yours. If you make that stone yours, people will come to you and treat you like a king, so make it sure to find that stone. He spoke in a barely audible whisper. When he died, he left me his last word, saying a will to find the emerald stone and make it as mine. I started wondered about the identity of the emerald Stone and found an old book while cleaning up his belongings. Sure enough, the book contained information about emerald stones, which has a information about emerald stones are the source creating vital resources for the Earth and for all life on Earth. Suddenly some thoughts just sparked in my brain. I felt that if I had this stone, everyone in the world would not treat me like a stranger but they will try get close or be nice to me. Since then, I have traveled all around the world looking for the green shiny stone and finally found the boy with the emerald stone in Washington Square Park, New York, where I was born and abandoned. With my ten-year-old shadow skills, I became the child’s shadow and managed to take out the stone out of this poor kid. Now everyone will lie down in front of me and no one will hate me. Later, Joseph tries so hard to find the stone. And one day, finally, he finds the stone in space covered with green grass in the Washington Park. But when Joseph was going to pick it up, the stone got so heavy that it does not move even though he used all his powers. He realizes that only the person with superpower can handle it. Then, he sees a boy hanging out in the park and finds the stone too. However, it seems so easy for him to get the stone from the ground. Joseph is so surprised and decides to follow him and help him to develop as a superhero. So that’s why Joseph shows up in front of the boy, Jin. It truly takes long time to build a good relationship between Joseph and Jin. After they know each other very well, Joseph decides to start train Jin step by step. The most basic training is the physical development. Joseph asks Jin to keep a good habit of having at least eight-hour sleeping time everyday, and eat various healthy food, and Joseph also train him with fighting skills. Jin at first thinks it is easy for him to do but after several weeks, it becomes harder. He loses his patience to repeat same thing and gets bored about the training. He complains about why he only learns how to protect himself everyday instead of other cool actions like shooting or using weapons. Joseph asks him to stop training for one day to try to think about what kind of person he wants to be in the future and talks to him the next day. On the next morning, Jin runs to Joseph’s home pretty early. Without any questions, Jin starts to talk about his thoughts. He says it is so boring that he stays at home without doing anything. He thinks he wastes the whole day. To be a hero is his dream and he wants this dream come true one day. His tear slowly comes out and he continues his words. He says he felt so helpless when he was so young, and really wants to reverse this situation. Since he knows he can become a real hero one day, he is so excited and imagine to be a hero to save the world everyday. He thought he is going to be a hero really soon and he wants to have an extraordinary power. However, the training he gets everyday is not interesting, which is quite different with his imagination. He feels sort of bored, but after he had a deep thinking last day, he realized that to be a hero is not as easy as what he thinks. Even though he is one who is chosen to be the hero, it does not mean that he can use the power whatever he wants and his weak body cannot support him to be the hero. After listening the long talking of Jin, Joseph smiles and slowly starts his words. “So from what you are saying, I think you are developing to be a mature man. I am glad that you notice that hero also need to be trained even though you are the one with superpower.” Jin nods the head and follows Joseph’s requirements everyday. Day after day, Jin’s muscles grows and his superpower inside his body is developed as well. He earns an ability to destroy anything with a single kick or a punch. He can also run much faster than before, and he is more confident with his own power including both physical one and superpower. Joseph believes it is the time to teach Jin some shooting skills and let him know how to use weapons. The days start to be much harder, but Jin is determined to be a powerful superhero, so he never thinks about giving up. One day, Joseph calls Jin to have a conversation. He talk to Jin seriously that the danger is coming soon and his stone is really important for saving the world. His responsibility is to fight against Blader who stole the stone. This time, it’s Jin’s turn nodding his head and he is not the shy little boy any more. He is mature and powerful enough to overcome the future difficulty and fight against enemies. “Now, it is the time to prove my amazing power to all around the world!” Blader declaimed viciously. While Jin was growing into a hero, Blader also studied his super power, Shadow Transformation. In the past, if he could just transform his own shadow or become someone else’s shadow, now he developed a technique that would allow him to manage other people’s shadows like puppets after a long study of his magic black stone and emerald stone. Blader stopped the shadows of everyone in near Jin’s house and in Washington Park, and starts to attack them. People’s scream echoed throughout the whole city and every 10 seconds, with a roar, Blader began to destroy the buildings as well. In his eyes, it was only filled with rage, rashness, and bliss for destruction without any sympathy. While the park was turning into a bloody chaos, Jin finally appeared in front of Blader. When Jin arrived at home, everything had been destroyed including buildings and the park. Jin asked people what happened, but none of them answered. They acted a bit strange. Jin felt like someone was controlling them. He noticed right away; it was Blader. Jin recalled what his mentor told him. He told Jin that Blader had stolen the magic stone. Jin came up to Blader and shouted. The emerald stone twinkled once, but nothing seemed to happen. Suddenly, his face stiffened. He said to himself, ‘what is wrong with this stone? Something should happen!”. While he was getting confused and all, Jin ran up to him and kicked him. A split second later, jin could see his body crashing into the ground. At the same time when Blader fell on the ground, everyone got released from the magic. Jin took the emerald stone from Blader and went under the arch, which was the only thing that was not destroyed. He held up the stone high and said, “Let me bring back everything that was destroyed!” Suddenly, the stone twinkled twice, and every broken part of the building started to rise from the ground and went back to its original place. Not only that, but it started to heal everyone who got injured or hurt from Blader. In a minute, everything went back to its original state, and people started clapping for Jin, who saved the world against Blader. People also started to call him a ‘hero’ who saved everyone’s’ lives.